Every Tuesday I try to write something interesting and helpful about how to use Blackboard. There is a lot to learn in Blackboard, and although I’ve used it for years, both as a student and faculty member, I still am learning new stuff. 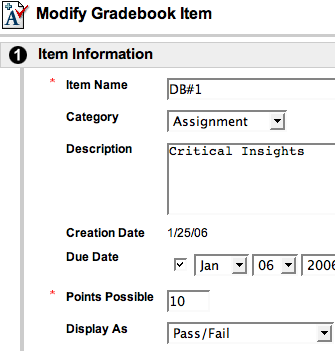 For instance, I didn’t even know that you could configure the gradebook to customized scores, such as Pass/Fail. If you need help with customizing the grades in your gradebook (especially the weighting option), don’t hesitate to call Blackboard assistance at 426-2583 or email them at blackboard@boisestate.edu. However, I bet you can figure it out. Here’s where you would go, for instance, to set a Pass/Fail option in your gradebook. After you do this click submit and then check out your new option by creating a sample gradebook entry and then making it Pass/Fail (select this instead of the default Score). Then enter a score that should be passing and see if that is entered in the Gradebook. Then do the same for a failing score. If it is not working the way you want, contact Blackboard Support to fine tune it . . . it shouldn’t be a big deal for them! Try out different scoring options in the Gradebook by adding your own type of grading option and customize your grading the way you want. You can do it in Blackboard.